Did you know that there is an invisible force right beneath your feet that can bring us amazing health benefits? What if I told you that it’s free for everyone to use whenever they wanted and that with its use you could bring down a fever, feel more centered, or even improve your cardiovascular health in the process without even moving? Sounds intriguing right? Well I assure you, it’s one of the simplest, if not THE simplest and most widely available forms of natural healing there is. It’s called Earthing, something that we as humans have sadly drifted away from recently. Now we live in houses without packed earth floors, wear rubber soled shoes, and live a life surrounded by EMFs (Electromagnetic Fields) that are bad for our health. No longer are we as close to the earth as we once were when tilling the soil or sleeping under the stars. The unconscious practice of earthing has almost disappeared except for children (who are always willing to play in the dirt) and the adventurous outdoorsy adult. So What is This Earthing Business Anyways? Have you ever noticed how rested and relaxed you feel after a nice vacation on the beach? I bet you have! Also known as “grounding”, earthing is the electrical bond we share with the earth. When we walk barefoot on the beach, in our gardens, or even on concrete we are in tune with the earth’s electrical pulse. As we step onto the soil after kicking off our shoes the negative ions from the earth’s surface rush up through our feet and throughout our bodies, discharging any imbalanced positive ions we’ve been lugging around. These positive ions, aka free radicals are largely involved in premature aging, inflammation, disease, and even cancer. When we expose ourselves to the earth through our bare skin, the earth’s healing energy floods in the good and kicks out the bad, bringing balance and healing into our rushed and crazy lives. We are all intertwined with electrical energy, and at times our modern lifestyles and the gadgets that come with it can really throw us off. For instance, EMFs are constantly bombarding the body when we use or are near computers and cell phones. We are also exposed to pollutants and other forms of toxic overload which tire us further and age us faster. So what exactly can earthing do for you? Perhaps one of the easiest ways to reduce stress is to get outside and kick your shoes off. As soon as your feet touch the ground your heart rate variability is improved. This not only improves your cardiovascular health, it also has been shown to reduce stress and even decrease symptoms of anxiety and depression. AND If you’re suffering from adrenal fatigue, this could very well be one of the best things you can do for yourself and it’s so easy! Constantly wearing shoes and being disconnected from the earth can have a profound effect on our bodies. When free radicals run rampant through our bodies, chronic and acute inflammation is increased. By neutralizing free radicals with the negative charge of the earth’s surface, inflammation and by extension pain, can be reduced. Since our bodies return to equilibrium after earthing it’s much easier to have deep restful sleep. In fact our REM cycles after earthing for 45 minutes and especially if we are earthing WHILE sleeping (you can get earthing sheets HERE ) will increase our body’s ability to repair and restore itself. Inflammation also decreases which allows us to sleep more comfortably through the night. Many experience waking up refreshed, energized, and with less pain after earthing. If you’re feeling sluggish, stagnant, or just worn out then I highly recommend earthing! I actually do this a lot during my breaks at work and I really feel a difference in energy levels, even my mood. Again, the negative ions from the earth are pushing out the bad allowing your cells to focus on their tasks better instead of dealing with stress and inflammation. Earthing has been shown to increase white blood cell activity, so naturally, earthing is great for when you’re feeling under the weather. In fact, I had a pretty terrible fever a few years ago that wouldn’t break. I had been reading about earthing and someone mentioned that their fever went down after earthing for 20 minutes. Whether or not it was because of being outside with my shoes and socks off or the healing power of earthing I’ll never know exactly, but I can say that my fever DID in fact go down after earthing for about 30 minutes. Of course walking outside barefoot is the cheapest way if you live where you are able to walk around safely. For earthing to work, you must be barefoot and in contact with the ground i.e. the soil, rocks, concrete, or water. 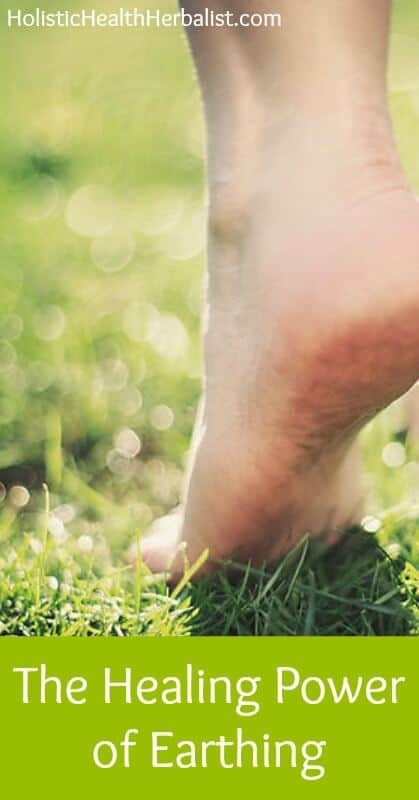 If you’re not able to walk around barefoot because of where you live or because of health reasons you can still reap the benefits of earthing by using an earthing mat, an earthing pad (for under your desk), or even by sleeping on earthing sheets! I’ve been wanting to try an earthing mat under my computer desk to increase healthy circulation for a while now because let me tell you, blogging can really make you feel sluggish! I’ll let you guys know what I think of it once I get one. Getting an earthing mat (or sheets) is a great alternative to earthing outside. You still get the earth’s natural negative electrons right through a grounded outlet in your home, even if you live in a high rise apartment. Don’t worry, these mats are totally safe! • Earthing Flip Flops or Shoes! I can’t wait to try these out! Have you ever tried earthing before? What was your experience? I too am barefoot all the time. Only wear shoes when I have to leave my house. I love being barefoot in the rain, so relaxing. I do my gardening barefoot. I even go barefoot for a short time in the winter. I have a hard time wearing shoes. I am relaxed, peaceful, grounded and one with my environment. This is how I feel too Denise! I grew up running around barefoot and I still do it. Best feeling ever! I have never heard of this but makes complete sense! I am always, almost always barefoot and love it.. it relaxes me and explains a lot. I love to walk barefoot outside. I’ve been like that since I was a kid! I also picked up a good read from the book fair a few weeks ago about Earthing. Oh yes! Now that it’s warm outside, I need to take a few short barefoot breaks outdoors. I can always notice a clear difference in my stress afterwards.